I had the chance to use the Lise Watier PINK POWER Blush ($30) and QUATUOR PASTEL POWER Eyeshadow Quartet ($36) over the last few weeks. I was also sent a couple of nail polishes from their Pastel Power Spring 2013 Collection which I'll share my thoughts about it at a later date. I'm in love with the packaging of the blush and the shadow palette. It's so retro feeling with the frost mint blue color. 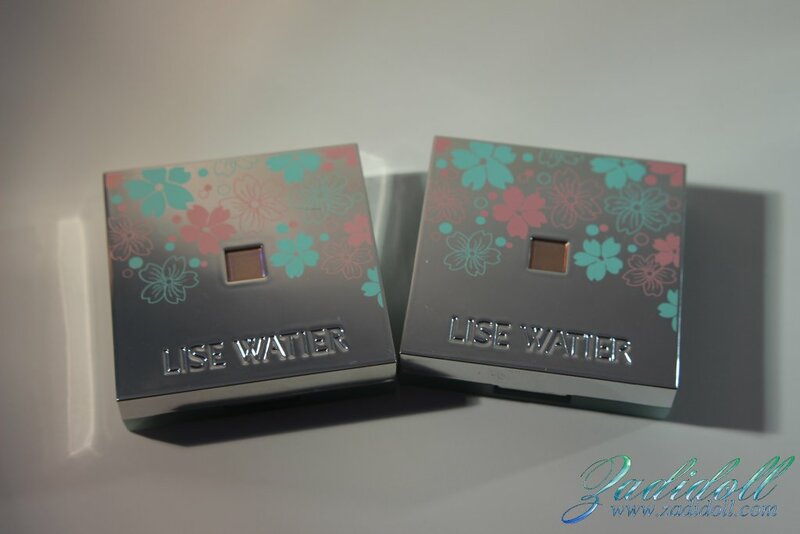 I'm an absolute sucker for packaging and these Lise Watier compacts are just absolutely gorgeous to me. The inside mirror is nice and large instead of a tiny mirror that some blushes and some shadow palettes have. I'm nearsighted and I need a good size mirror in my hand to do my eye makeup and the mirror in both compacts are perfect for me to use. Also, the hinges in these compacts allow you to fully open the compact (I have it at a 90 degree angle in these pictures) which again helps me because of how nearsighted I am. Nothing annoys me more with compacts when I can't get the lid to go past a 90 degree angle while using the mirror. Some people may find the exterior packaging to be annoying because of the mirror finish as fingerprints show up so easily. I do have to wipe down the exterior before putting it away when not in use. The other issue I have with the packaging is that the latch gets stuck from time to time making opening it difficult at times. I've had the chance to use these products over the last few weeks and I have to say while I love the blush I'm still on the fence about the shadows. Don't get me wrong, I think the colors in the shadows are very pretty but on me I'm still not sure I like these colors on my skin coloring. I think the shadows are more suitable for my youngest daughter who has a light skin coloring than I do and has red undertones while I have yellow undertones. Of the four colors I do like the teal green and the light coral the most. The light blue and light gray colors are colors I normally would not personally wear while the teal green and light coral are colors I'm comfortable wearing. I do wish the green was the larger of the four colors essentially swapping places with coral next to it. I did have a couple of issues with the shadows. The first was with the teal green being too pigmented and as a result it stained my skin even over certain primers. I found that with all four shadows that if I used a thicker, heavier primer that worked better to prevent staining and to help the color pop more. I like using these shadows with Lime Crime's primer and SauceBox's primer because both are on the thicker side than Urban Decay's Primer Potion. When I used it with UD's primer the teal green stained and the pale blue didn't pop. The second issue was with the pale blue color being too pale on it's own but when paired with the green it's just gorgeous. As for the blush, how pretty is this blush? 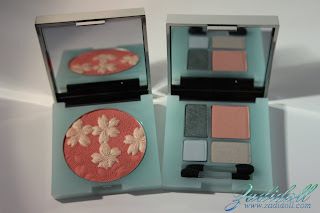 I felt guilty, at first, using the blush because of how pretty the embossing was. I got over that quickly and have worn the pattern down in the center now. The primary color is a lovely matte terracotta with a light pink that has gold glitter in it. I think it's complementary to most skin tones but if you're very fair skinned this may not work with your coloring unless you have a very light hand as the terracotta pink might possibly be too dark for those who are "Snow White". The blush blends out beautifully. The peachy gold color is just beautiful on it's own and can be used as a highlight or mixed together as in my swatch picture. The terracotta on it's own... well too dark for my preference but mixed together it's gorgeous. The color on me is long lasting however like everything on me it does fade off my skin over the course of the day and about eight hours after applying I not only need to touch up my foundation but my blush as well. Both the blush and the shadow quad are small enough to fit in a medium makeup bag for travel so I took these along with my primers, foundation, lip tint, one eyeliner and mascara with me on our trip to Seattle and it all fit inside my BeautyFix cosmetic bag. Overall, I like liked the blush from Lise Watier but am disappointed that it is not part of the permanent collection because I would repurchase the blush.The shadows on the other hand I'm still on the fence about. I think Lise Watier should keep the blush part of the permanent collection. FTC Disclosure: Items provided to me by Lise Watier for reviewing purposes. Nice blush, I love the packaging!